Come to `Ikena Kai to experience the life-enhancing mystique of Kauai’s spectacular North Shore. This tastefully decorated, non-smoking, one-bedroom suite is perched on a cliff and offers a stunning 180-degree view of the ocean and majestic waterfall-laced mountains that will capture your imagination and take your breath away. The view from `Ikena Kai is beyond compare. It's the ideal place to relax and unwind or have the time of your life as you enjoy the many nearby activities. The suite is fully furnished with everything you need for a carefree vacation. `Ikena Kai was completely renovated in January 2015 and is now one of the most beautiful condo rentals in Pali Ke Kua or all of Kauai. Our renovation includes new travertine-style porcelain tiles in the living area, newly painted walls, new window coverings, furniture from Room & Board, West Elm and others, Bose SoundTouch WI-FI music system, LG flat screen TV, Caesarstone Quartz Countertops, GE stainless steel appliances (fridge with purified water dispenser, dishwasher, stove, and microwave), new carpet in bedroom, new Westin Heavenly Bed, premium sheets and linens, completely new bathroom including new porcelain tiles, toilet, sink). Start your day with a breakfast of fresh fruits grown by local farmers. Then, stroll through our lush tropical vegetation as you use our private paved path to visit a magnificent golden-sand swimming/snorkeling beach with sparkling blue and emerald water. Fall asleep to the sound of the surf or watch the whales and dolphins play. As the day ends, take a moment to admire our gorgeous sunsets from your lanai. Then, enjoy fine dining at our onsite restaurant or one of the nearby restaurants - or cook your own meal in our fully appointed kitchen. Throughout your stay, find everything you need at the Princeville Shopping Center. When you feel like exploring, take a short drive to one of the many exquisite beaches along Kauai’s North Shore or to the quaint, historic town of Hanalei. The following serves as notification of our 'registration identification number' in compliance with Hawaii Act 326: W00703854-01. Please note that you are renting a condo unit. This is not a hotel. We do not have daily maid service, concierge service, and the kitchen will not be stocked with food. Our commitment is to provide a clean condo unit that is as described in this listing. A signed rental contract and a copy of a government issued I.D. is required to complete your booking and receive access to this property. The contract will be emailed to you by the owner for your signature. Please let us know if you would like to review a sample lease before booking. I've owned this unit since 1999 and have been visiting Kauai since 1994. I live in San Francisco and run a software and consulting company that focuses on payment strategy, fraud risk, and analytics. Ikena Kai was renovated and upgraded to the highest standards of design and quality in 2015. Ikena Kai offers a unique sense of space and privacy since it's located on the ground floor of a 4 unit building - only 1 neighbor to the left, and no adjacent units to the right. Pali Ke Kua is one of the most respected and sought after condo complexes in the island. The grounds are beautifully maintained and the location offers easy access to North Shore attractions. There are few places in the world that offer a view like Ikena Kai. The panoramic north facing view defies description and includes endless deep blue ocean, endless deep blue sky, massive crashing waves (in season), and the famous Bali Hai mountains. My wife and I stayed a week at Mitch’s Condo to celebrate our 10th anniversary. We stay at VRBOs/Air BnB’s for all of our travels and this was by far the best. It’s comfortably and modernly furnished and the kitchen has everything - I mean everything - you would need to cook a five-course meal. The view is sensational from the patio or just sitting in the living area. The condo is exactly as described and looks just like the photos. It’s actually better than we expected and would come back again. Nearby activities: cycling, helicopter tours, surfing, body boarding, kayaking, diving, snorkeling, hiking, horseback riding, windsurfing and fishing. 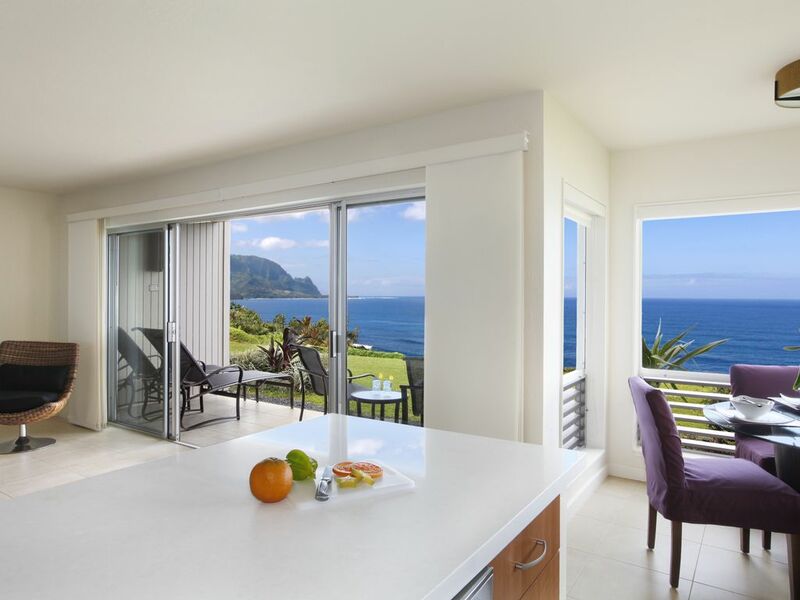 The `Ikena Kai Suite at Pali Ke Kua is located in the prestigious Princeville Resort. Princeville is a quiet resort community that is also home to the well-known 18-hole Prince and 27-hole Makai golf courses and the 5-star Princeville Hotel. The resort offers shopping, fine dining, gorgeous sunsets and spectacular views of Hanalei Bay and the Bali Hai Mountain, made famous in the movie, 'South Pacific.' The North Shore of Kauai is best known for the quaint historic town of Hanalei, exquisite beaches, lush tropical vegetation, and majestic mountains laced with waterfalls - all of which can be enjoyed from `Ikena Kai.